Special VIP seating available at tables right next to the stage - $25 each. Ticket includes complimentary snacks and drinks. ​Limit of 20 VIP seats at each performance. to our beautiful and strong fx gals! 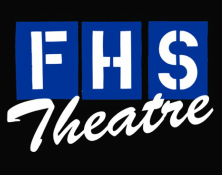 General Membership meetings for the FHS Theatre Boosters will take place on the 2nd Tuesday of the month at 7:00pm in the Theatre Room, M-107. With the spring musical upon us, it's time for Volunteer Sign Ups. There is an awful lot to do, be it helping with a meal for hardworking actors and techies, donating snacks for Concessions sales, or driving kids around. Please help as much as you are able. Click on a Sign up for more info about times/dates/duties. If you would like to make a direct donation to support FHS Theatre Boosters, click on the Donate button at right.